Our Rise Up programme helps young people build confidence and develop skills through adventure. Rise Up, our outdoor education programme, helps children boost self-esteem and learn a range of new skills. Rise Up is an adventure programme hosted by New Zealand Red Cross in Palmerston North. 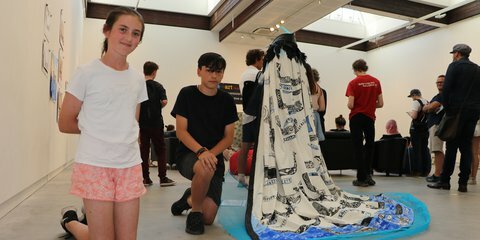 Held during the summer holidays, the programme gives students the chance to 'rise up' through challenges that build self confidence and develop new skills. Participants use problem solving and teamwork skills to take part in a range of activities, from camping, participating in a fire service exercise to jumping off a wharf. Aimed at 10 to 12 year olds, the programme takes place over four days and three nights. It combines a mix of outdoor education skills as well as modules to help young people along their future path. The New Zealand Fire Service, New Zealand Police, Surf Life Saving New Zealand and the New Zealand Army help us deliver the programme. Build self confidence and learn to work with others, including those of different generations. Develop skills including problem solving, decision making, communication, planning and teamwork. Interact with positive role models. Get to know a selection of service organisations that could be future career options. The programme also helps coordinate service-providing partners and builds sustainable local relationships. It builds healthy relationships between teenagers and local agencies and services. Have no serious behavioural issues. Rise Up is currently only offered in the Palmerston North and Gisborne areas, but may be expanded in the future. 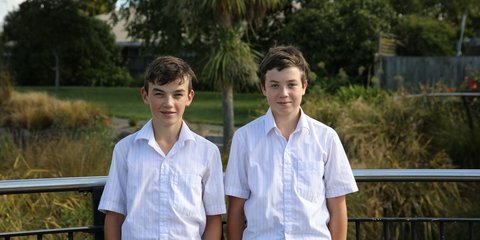 They may still be teenagers, but these Christchurch twins have been supporting Red Cross for years.